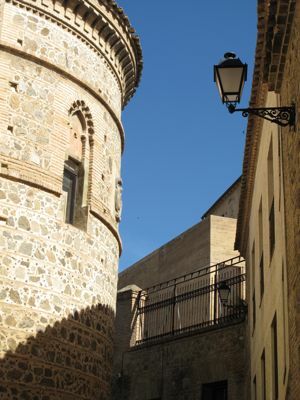 We decided to go on a half-day speed tour of Toledo, thinking a bus ride through the arid countryside, would be less taxing on the pedi-impaired Teen. Oops, not. Thank goodness there were escalators (from the drop off point) for much of the ride up to this small but extremely interesting and historic town on a hill above the Tagus river, but there was still quite a bit of walking involved in this tour. The Teen managed reasonably well, and in just a couple of hours, we were able to take in the highlights of Toledo, the former capital of Spain (before Madrid) and site of wave upon wave of various conquerors over centuries and a mish-mash of Jewish, Christian and Muslim religions. One of the coolest tidbits we took away from our guide that day? That Sephardic Jews originally hailed from Spain until they were booted out in the late 1400’s… and the Teen thought it so poignant that the Sephardic Jews took along the keys to their homes when they left, always believing they would be allowed to return home. “Sepharad” is the modern Hebrew word for Spain. With stunning and historic buildings, places of worship, monuments, narrow alleyways, gorgeous art, and a thriving local community of residents, this was a bit reminiscent of our visit to towns like Sienna, Italy a few years ago. 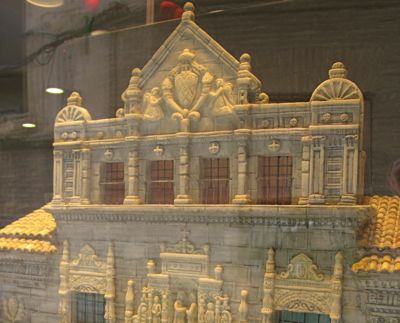 It boggles the mind that such ornate edifices and stunning churches were already being made just about the time that the Philippines was being “discovered” by Magellan! This wonderfully balanced building, so appealing to the eye, was the seat of local government, if I recall correctly. 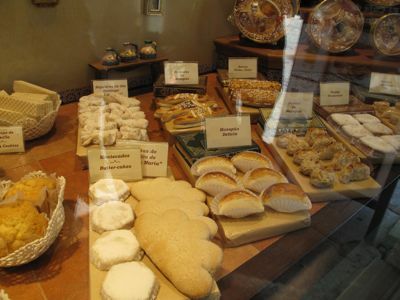 Didn’t manage to jot down the name, as between taking photos, listening to the guide, helping the teen navigate with her cast, and wanting to stop at the window of every pastry shop, I was trying to avoid getting left behind. It was a beautiful day, with clear blue skies, some 70F around lunch time, and perfect walking/touring weather. Built on a hill, a natural and more readily defensible site, the town was constructed with several small passageways or streets and even smaller pedestrian alleyways. It’s all quite well preserved, and definitely like visiting a living museum. We managed to see El Greco’s masterpiece, The Denuding of Christ, in the Toledo Cathedral, as well as other sites such as the Sinagoga del Transito, Monasterio de San Juan de los Reyes, local museums, etc. 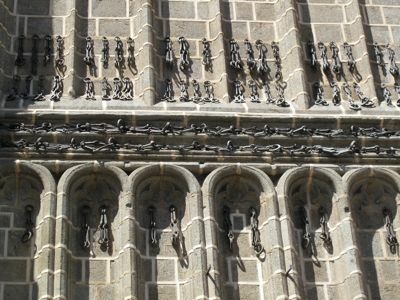 And on the side of the church, this odd array of shackles or ancient handcuffs were hanging, apparently to remind everyone of the time the Christians were held captive by the Muslims in the Southern parts of Spain. 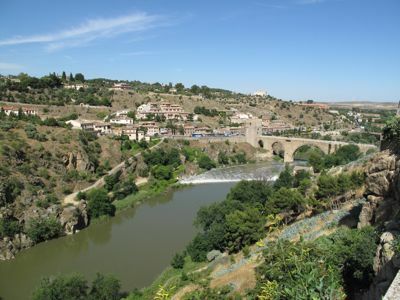 Toledo is roughly an hour from Madrid by bus, totally worth a half-day visit, stay a day or even overnight if you want more time to explore. Just a possible correction… Sephardim refers to the Jews originally hailing from Spain but Sepharad, I believe, is the name for Spain itself. great travel post again MM…more please! Roelm, you could be very right on that one, I wasn’t taking notes… thanks, will edit. Simply beautiful. Thanks for sharing MM. More pics, perhaps? I always think of weighing scales when I see ‘Toledo’. Funny thing my sister went to Toledo to see the Toledo painting of El Greco, only to find out it was at the Metropolitan Museum of Art in NYC, where she came from. She says that her Spanish was useless as the locals have a different accent/dialect and she could not understand them. Toledo is so awesome! Such a fun little town, and it’s only an hour south from Madrid. We drove down there for Christmas and New Year’s at Madrid. Would love to visit Toledo, again. You mentioned, Sienna. we love that town, too! i’m having an Italy-withdrawal now, and we were just in Italy. hahaha! As it turned out, those who were allowed to leave and left and settled in Islamic territories were the lucky ones. Those who converted and stayed shortly became the prey and victims of the Inquisition. The rest that spread throughout Europe were intermittently victimized, isolated and cropped until the so called final solution would consume the bulk of them. Meanwhile, in Spain, the consumption of pork became the ultimate badge of religious and ethnic purity. And there is the Market Manila connection, finally. Still in print and still an astounding read is Iberia, the best introduction to Spanish history and culture that James Michener wrote in the sixties. Unfortunately, it only takes you as far as Franco. Hi MM. I found half a day didn’t do Toledo justice. Fascinating place, so much to see. The Monasterio de San Juan delos Reyes was built by Queen Isabela with the intention of making it her and King Fernando’s mausoleum, right? (although they were eventually buried in Granada). Would have wanted to thoroughly explore every nook and cranny of this place, but only got to see the inside of the church and the courtyard. I remember the lone orange tree that was teeming with fruit in April last year. That view of the Tagus River– did you take that from the vantage point of a small but very stylish modern art gallery perched on a cliff / mountainside? (I forget the name). 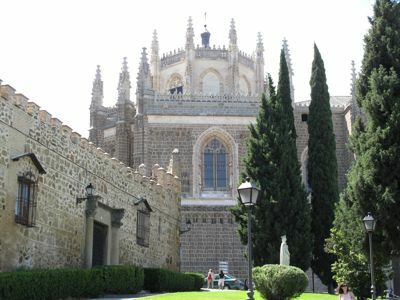 Did you go to Segovia and Avila too? I believe the building with the towers at each corner is the Alcazar. Which like many “Spanish” words beginning with “Al” is in fact Arabic. This building looks more like the Ayuntamiento Kurzhaar. But you are close, the AlcÃ¡zar has the same pyramidal tower roofs and square symmetry though considerably taller and far grander. 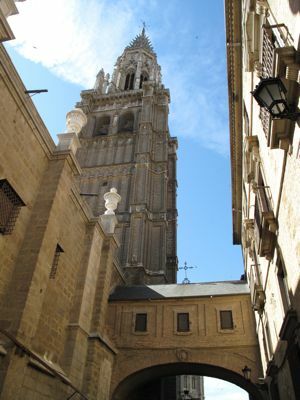 From certain vantage points, it actually dominates the skyline of Toledo with the Cathedral tower running as far second. And right too about Spanish words beginning with al- such as our Filipino word for syrup, arnibal which we took from almÃ­bar. Funny though, maple syrup is called jarabe de arce. Donâ€™t know where that came from. My family went through several generations of being sephardic, but stayed in Spain during the expulsion in the 15th and 16th century. Many years ago, while having breakfast in a cafe in Copenhagen, it was thrilling to meet sephardic Eastern Europeans and find we still could converse in a common language. Thanks, Footloose–on second look you are right that this is a much smaller scale building…presumably influenced by the Alcazar when it was built. Beautiful architecture. This post reminds me of a book I read regarding the Spanish Inquisition of 1491, which recounts the dark days when Spain was besieged with ‘witch hunts’. the gothic cathedral of Toledo was the most beautiful I had seen. 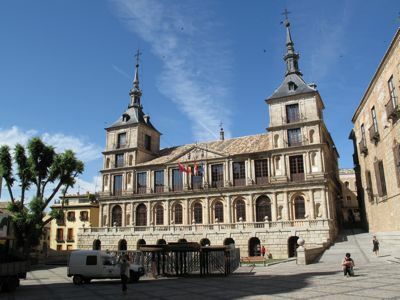 Definitely, Toledo is a must-visit town especially if one is already in Madrid. 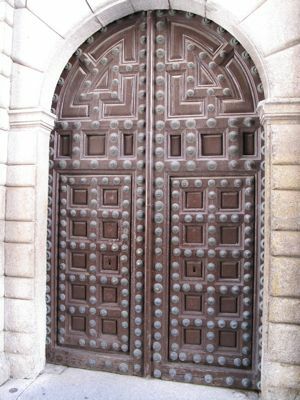 Another great place to visit is El Escorial. I couldn’t forget Valle de los Caidos- a landmark of Fascist Spain. Very nice! 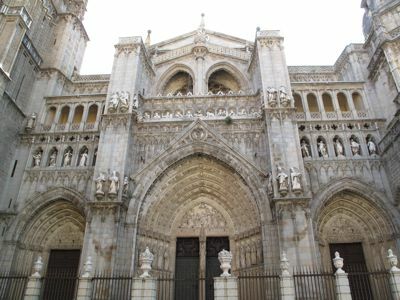 I love Toledo and its magnificent cathedral, it’s one of my most enduring memories of my visit to Spain. The marzipan, wow! I remember my first view of the town from across the river, the enchantment was immediate. Very definitely worth the drive from Madrid, even for just a quick visit. I didn’t stay overnight either. Gina, I remember the orange tree laden with fruit. I think we were told it was a sour orange, like the Seville orange, maybe that’s why no one was picking the fruit. History does depend on who wrote it? why they wrote that way? 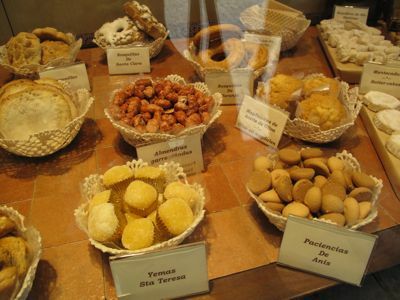 I love having studied in Spain as I was able to kinda find myself there and to think that the Spaniards also do dunk (sawsaw) their toast or bread (pandesal) in their coffee or hot chocolate was kinda refreshing (we got it from them hehehehe) . They do have San Miguel Beer and no its not from the Philippines (it’s their own). 2 hour lunches and 3 hour dinners, gotta love Spain. @Lava Bien – how can one trace if one’s famly has Shephardic Jew origins? Sadly, I’ve not been to Toledo. But thanks for sharing your lovely photos with us! Those yemas look delicious! This really reiterates the Spanish influence in Filipino cuisine. @Lava Bien Would love to experience being a Spaniard through the methods you accounted but my lineage goes back to the Gaddang tribe in Nueva Vizcaya, untouched by the Spanish but decimated by modernity. But I love Espana nevertheless! You don’t have to be a Shepardic Jew to be a Spanish citizen, just be born in either the Philippines, Puerto Rico or Cuba. Your mother has to be a jew for you to be considered a jew Most Shepardic Jew who remained Jewish moved to Morocco (the first country to ever recognize USA as a country – a muslim country). The muslims or jewish people who remained in Spain and Andalucia either were killed or converted to Catholicism. The converts loved to show the CastellÃ±os (from the area of Castilla y Leon) they love to eat puerco (Pig’s meat) to prevent any doubts that they truly converted to Catholicism for fear of reprisal from authorities. One can see this behavior in Mindanao also. Some people there get defensive if you think they’re muslim and would tell you “we’re not muslim, we eat pork ,we love lechon etc..) sad but true.. but I know Catholics who wouldn’t even touch any pork products…. Cochino = “bastos” nasty, dirty no manners. hehehehehe you are what you eat!!! Not to be persnickety, h after p, not after s. You guys make it sound as though members of the flock are sheep herders.